I have lived all over the United States and have known some beautiful and some wicked weather. In Ohio, my home state, I remember some brutal winters with freezing weather and lots of snow. Summers brought great thunderstorms and large wind. In Minnesota it was even colder and the snow would come in the winter and stay until spring. In Kansas I survived extremely fierce thunderstorms, and yes, plenty of tornadoes. California had earthquakes and Florida had tropical storms and hurricanes. I never doubted that God controlled the weather. Even so, sometimes we are faced with giving an answer to why God would send wicked weather and allow innocent people to suffer and even die. The Bible has much to say about weather and I have chosen just 8 great KJV Bible verses and passages about weather to share with you here. Perhaps it will answer some of your questions or even provide an answer that you might share with someone else. Leviticus 26:2–4 Ye shall keep my sabbaths, and reverence my sanctuary: I am the LORD. If ye walk in my statutes, and keep my commandments, and do them; Then I will give you rain in due season, and the land shall yield her increase, and the trees of the field shall yield their fruit. Leviticus, also known as the Book of the Law shows weather as a blessing for obedience. The LORD gives the command and follows it with the promise. Job 37:9–14 Out of the south cometh the whirlwind: And cold out of the north. By the breath of God frost is given: And the breadth of the waters is straitened. Also by watering he wearieth the thick cloud: He scattereth his bright cloud: And it is turned round about by his counsels: That they may do whatsoever he commandeth them Upon the face of the world in the earth. He causeth it to come, whether for correction, Or for his land, or for mercy. Hearken unto this, O Job: Stand still, and consider the wondrous works of God. This is my “go to” passage when I am asked that question: “How could a good God cause such terrible weather that takes the life of the innocent.” Weather can be devastating and in a moment it can totally change your life, whether it is by loss of loved ones or loss of a house and/or possessions. In this passage from the oldest book in the Bible we see three reasons why God “commandeth” the weather to do what it does. (1) for correction; (2) for the land; and (3) for mercy. To answer that hard question, oftentimes I say it is because we have a merciful God and sometimes He takes the innocent home to avoid problems on earth. Though this is not always the case it can bring some comfort. Other times He uses the weather to bring correction and judgment to the wicked. And sometimes the weather is sent to take care of the land, like rain to water the crops and snow to cover the ground and protect it from a deep freeze. Deeply frozen ground lacks the moisture that is needed in the underground which the crops draw up in the hot summer months when there is no rain. The Psalmist in this passage is calling out to God to correct his enemies. He is asking God to send a tempest (a violent windy storm) and to “make them afraid”. But notice that the Psalmist is not asking for judgment, rather he is asking that God do this so that “they may seek thy name, O LORD”. The Bible tells us we should pray for our enemies (Matthew 5:44; Luke 6:28). This is a powerful prayer! Jeremiah 10:12–13 He hath made the earth by his power, He hath established the world by his wisdom, And hath stretched out the heavens by his discretion. When he uttereth his voice, there is a multitude of waters in the heavens, And he causeth the vapours to ascend from the ends of the earth; He maketh lightnings with rain, And bringeth forth the wind out of his treasures. Here is a great proof text for how God has made the weather. More specifically: rain, dew, lightening and wind. He made it and at the sound of His voice the weather does whatever He commands. Another great Old Testament verse that seems to say that the LORD does not excuse nor release the wicked of their guilt. This is where I believe we can prove Scripture with Scripture and see that “He causeth it to come … for correction” (Job 37:13). Matthew 16:2–4 He answered and said unto them, When it is evening, ye say, It will be fair weather: for the sky is red. And in the morning, It will be foul weather to day: for the sky is red and lowring. O ye hypocrites, ye can discern the face of the sky; but can ye not discern the signs of the times? A wicked and adulterous generation seeketh after a sign; and there shall no sign be given unto it, but the sign of the prophet Jonas. And he left them, and departed. In this passage Jesus was being tempted by the Pharisees and the Sadducees (vs. 1) who wanted a sign from heaven to prove that Jesus was who He said He was. Of course Jesus knew that they were goading Him and trying to make Him fail and as was Jesus’ way He answered them by revealing their own actions. They were blind to the signs of the times. He used the weather to “correct” them. And in the end He left them with a puzzle – the sign of the prophet Jonas (Jonah). Do you understand that sign? Luke 8:23–25 But as they sailed he fell asleep: and there came down a storm of wind on the lake; and they were filled with water, and were in jeopardy. And they came to him, and awoke him, saying, Master, master, we perish. Then he arose, and rebuked the wind and the raging of the water: and they ceased, and there was a calm. And he said unto them, Where is your faith? And they being afraid wondered, saying one to another, What manner of man is this! for he commandeth even the winds and water, and they obey him. Here is a very popular passage from the New Testament. Jesus was getting some much needed sleep in a boat when a storm was brewing on the sea. The apostles were frightened by the raging sea and were astonished that Jesus was sleeping through it all. Now you must understand this was near the beginning of Jesus’ earthly ministry and the apostles were still getting to know Him. They had not a clue of His ability to command the winds and water to obey Him. They were not only astonished that He slept through it, they were amazed that He calmed the storm with His voice! James 5:17–18 Elias was a man subject to like passions as we are, and he prayed earnestly that it might not rain: and it rained not on the earth by the space of three years and six months. And he prayed again, and the heaven gave rain, and the earth brought forth her fruit. Elias is the English translation of the Greek name for Elijah. Elijah was a prophet and in this passage in James 5 we are reminded that Elijah’s prayers were used to call out to God to stop the rain for a long period of time. At the time of Elijah the Israelites (under the rule of King Ahab) turned from the One True God and began worshipping a false god, Baal. Elijah asked God to stop the rain so that those following Baal would call out to their false god for rain. After a 3 ½ year drought (in which God fed and gave water to Elijah) Elijah called unto God seven times and God sent the rain. In this the people saw that there is only One True God because the false god Baal had no power at all over the weather. You can read this amazing account of Elijah in First Kings Chapters 17 through 19. The Bible has many, many things to say about weather. 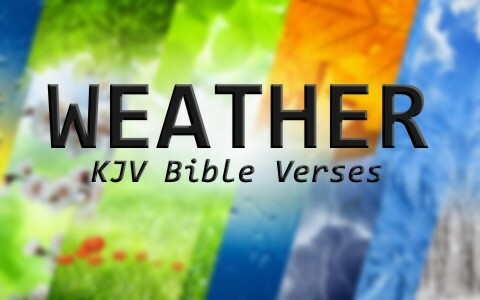 I have shared just a few of my favorite KJV verses and passages about weather here. Would you like to share some more? Related reading: Are Natural Disasters From God? Thank you for sharing your biblical knowledge. I wanted to better understand why God allows the hurricanes. My K-Love radio station had a speaker comment something along the lines of God not being in control of the storms but Satan having the power over them. I have confirmed my belief of God’s all powerful control with the review you presented here. Thank you. I do wish you could tell me what instruction God gives us specifically in loving thy neighbor during times like these we have currently with all of the people suffering due to the hurricanes. Hello Shannon. Please check this out to see why that speaker on the radio station is wrong: http://www.patheos.com/blogs/christiancrier/ As for loving others, Matt 5 shows that we are to love others, even our enemies, so storms or not, we are to be the hands and feet of Jesus here on earth. Previous post: Is There Any Significance Of The Number Forty (40) In The Bible?